Faëria, developed by Abrakham, is a new trading card game in the middle of its Kickstarter campaign. We're excited to bring the official wiki to Gamepedia! 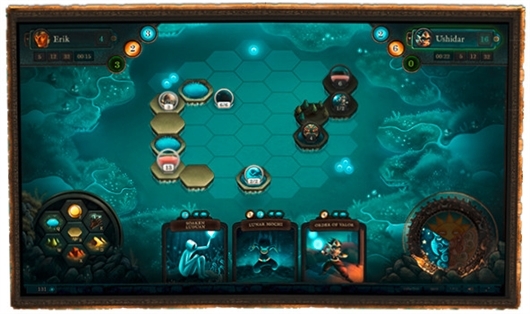 Unlike other trading card games on the market, Faëria is a one time purchased game, as the developer wants to create an even playing field, rather than have cards purchasable through microtransactions. But that is not the only thing that makes Faëria unique! Seemingly blending board games, trading cards, roleplaying and strategy games, Faëria offers gamers a fantastic blend of favorite genres in an interesting manner! The game gives you morning, evening and night cycles, where new faëria is produced when the sun rises. Collect new cards through gameplay! 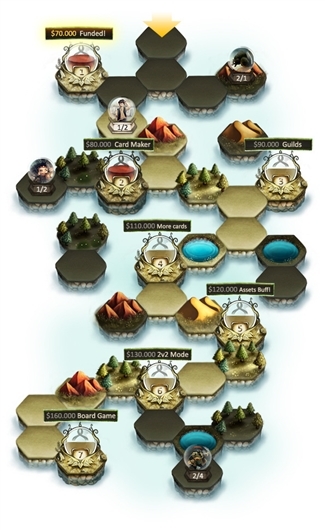 The board is a recognizable hex board, that allows for building and resource gathering. One dollar makes you a backer for Faëria, five will reserve your user name and fifteen gets you immediately into the closed beta! Entering beta now means that your account is set -- you won't have to worry about wipes between now and the game launching! Want an exclusive Kickstarter avatar? Become a Fortune Hunter for visibility anywhere you can display your account! With the Explorer tier, you'll have access to an exclusive test server and developer feedback. You and four friends can have all the fun together with the Trinity tier. Enjoy signed memorabilia? The Precious tier is just for you! With the Luxurious tier, you can even have a physical deck of your choosing! The rewards don't stop there and there are so many amazing levels to choose from! Faëria might be successfully funded, but you can help get through stretch goals! Not only does this trading card game offer what you would expect from a TCG, but there are also solo quests, a progressing story line and a fantastic community! The forums offer tutorials to get the newest member up to speed. Another way to be a part of the community is by contributing to the wiki. Whether you found out of place punctuation or need to add in an entirely new page for a card you couldn't find, each contributor only strengthens the community. Gamepedia makes sure you have the tools you need to be as successful as possible! If you just need the basics, or a refresher on what to do, check out the help page found on any wiki. There is also the Help Wiki, complete with tutorials, for a better overview. Got a question you can't find the answer to? Join #Gamepedia on IRC and ask us! Are you aching to give Faëria a try? Gamepedia is offering beta keys to the first 1000 people to request them HERE. These codes will grant full access until Friday November 9th at midnight CST, but if you enjoy the game you can upgrade your account to a full-access beta by donating to the Kickstarter project.